Computer errors are frustrating. A classic one is when you don't have a keyboard connected when a computer starts. 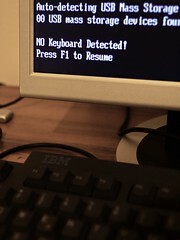 One line on the screen points out that the keyboard is missing, and the next line on the display instructs you to press a key! The spiritual path is full of such contradictions. In the Zen Buddhism tradition a kōan is statement that cannot be understood rationally, but can be a path to faithful reflection. "Press the F1 key when you are missing a keyboard." might be an update of the classic kōan: "What is the sound of one hand clapping?" A popular list of contradictions among the followers of Jesus is the beatitudes , ( "Blessed are the poor, the hungry, the weeping..." ). While often read as "Blessed", The Jerusalem Bible and others understand this word as "Happy". This leads to contradictions such as "Happy are those that mourn..." among others. (These lists are found in Matthew 5:1-10 and Luke 6:20-23 ) Like our computer kōan, these do not make sense, but can make faith. I hope the next time you are frustrated by something that is just not rational, you'll pause to hear the sound of one hand clapping. It might be the key to God's blessing and happiness. You can eliminate credit card and insurance offers as well. There is no mail-in only option.